Have you ever had a change to travel to one of those tropical and exotic Pacific islands for fly fishing? well, its my dream! 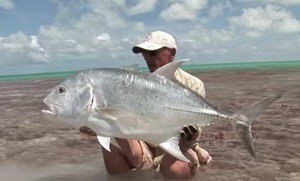 This man, called Peter Collingsworth, from United Kindom travels to Christmas Islands, Kiribati to show us how to cast, where to cast, what rod and what fly to use to catch gigantic Giant Trevally. Look at this beautiful fish! absolutely gorgeous. Not only so big in size but also good looking that makes you get even more excited. And see how the fishing line makes that seductive sound "wizzzzzzzz" . Many people goes to these magically attractive islands for romantic holidays. But there actually is an amazing marine life underneath their feet. And only passionate fly fishers could see it.